The optical parking system is a supplement to the parking distance warning system and the Park Assist system . The areas to the front and rear of the vehicle monitored by the sensors are shown in the display of the factory-fitted radio or navigation system. Potential obstacles are displayed in relation to the vehicle . Switch on the display: Switch on parking distance warning system or Park Assist system . OPS is activated automatically. OR: press the function button or RVC on the screen. Automatic switch off for the display: Drive forwards faster than approx. 10 – 15 km/h (6 – 9 mph). 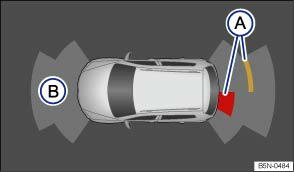 Select the reverse gear in vehicles with Rear Assist . The display will select the camera picture. The area in which obstacles can be detected is approx. 120 cm to the front of the vehicle and approx. 60 cm to the side or . The area directly behind the vehicle is scanned up to a distance of approximately 160 cm (152.40 cm) and 60 cm (60.96 cm) to the side or . The display shows the scanned areas in several segments. The closer the vehicle drives towards an obstacle, the closer the segment will move to the vehicle in the display or . The collision area has been reached at the latest when the penultimate segment is displayed. Do not drive on! A status display is shown in vehicles with a factory-fitted towing bracket and a trailer connected via the vehicle electrics. The distance behind the vehicle will then no longer be shown. You can mute the acoustic signals from the parking distance warning system by pressing the function button on the screen. Press the function button again to switch the acoustic signals back on. The muting will be cancelled once the parking distance warning system is switched off and on again. Acoustic signals cannot be switched off when there is a function fault in the parking distance warning system. Do not allow the images shown on the screen to distract you from the traffic around you. It takes up to 5 seconds before the area being scanned by the sensors is displayed on the screen of the factory-fitted radio or navigation system. a) The distance range for the constant tone is larger for vehicles with factory-fitted towing bracket.